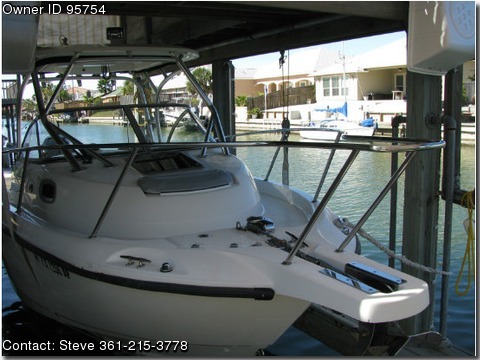 Call Boat Owner Steve 361-215-3778. 2006 Boston Whaler 235 Conquest, this Boat is in great shape. she has been professionally maintained twice a year by Sail and Ski of San Antonio. Raymarine E-80, radar and video ready. 325 Hours. 450 feet of rope with 20 ft chain on anchor. Anchor up current from rigs for best fishing. Seats and cushions redone in 2012. Regular servicing by Sail and Ski in San Antonio. Stored on boat lift when not in the water.